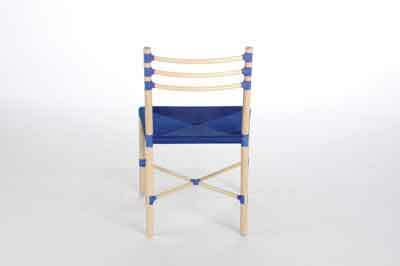 I made this chair as my major project in my third year at Buckinghamshire New University. I'm very interested in new technologies and how they're impacting industries and society, this was also the subject for my dissertation. I wanted to design something new that hadn't been done before, so I decided to explore the potential of using 3D-printing in furniture. 3D-printed pieces of furniture do exist, but they're wholly 3D-printed and as a result are incredibly expensive. I wanted to see how 3D-printing can be utilised to aid manufacture and combine it with cheaper materials and traditional manufacturing methods to create a piece of furniture. 3D-printing is a technology that enables the physical printing of three-dimensional objects in many different materials, from plastic to gold and even food. 3D-printing is starting to infiltrate many different industries but the furniture industry is still largely unaffected. If you search for 3D-printed furniture you'll find very few results and what you do find is ridiculously expensive as the pieces are wholly made using a 3D-printer, which is still a very expensive method of production. I think that although one day it may be economical to 3D-print whole pieces of furniture, I currently see 3D-printing working in partnership with traditional manufacturing methods and materials. The key aspect of 3D-printing to consider is that it doesn't differentiate between what is technical and detailed and what is plain and simple. A simple cube takes just as long to print as an incredibly detailed ornate design. This requires a new way of thinking as you no longer need to be constrained by how to join components or how long and difficult a joint intersect would be to construct. I wanted to utilise this potential and exploit its possibilities within furniture. At first I wasn't sure if 3D-printed joints would be strong enough, but research convinced me that they'd be up to the task. I knew that 3D-printing in nylon, when thin enough, has a certain amount of flex or elasticity in it. This elasticity got me thinking and I came up with the idea of having a 3D-printed clip which could clip around a component and stay in place. I soon realised that the 3D-printed parts weren't just components but were what makes the chair interesting and unique. Most 3D-printed parts are made in white plastic, which can be boring. Shapeways is a 3D-printing company that offers a variety of different materials and colours. I chose royal blue for my pieces as I liked the contrast with the white sycamore (Acer pseudoplatanus). Once I was happy with my design, I ordered the 3D-printed parts. Shapeways print and send the parts within three weeks. I ordered 30mm sycamore dowel from G&S Timber as it would save a considerable amount of time trying to turn 5m of dowel from solid pieces. The dowel is also consistently 30mm along the length, which I'd never be able to achieve turning it all by hand. I cut all the components to the correct length leaving some overlength to allow for clamping on the lathe. I then centre drilled all the dowels on the lathe ready for the threaded metal bar to be inserted. Once the 3D-printed parts arrived I could start assembling the chair. As the 3D-printed parts are the joints connecting the components the assembly of the chair was very quick. My design used threaded metal rods screwed and glued into both the 3D-printed parts and the wooden dowel. Using metal rods increased the strength of the joints considerably and increased the gluing area of the joint too. The 3D-printed parts needed tapping before the threaded metal rods could be screwed and glued into place. Once all the pieces had been tapped I could then insert the metal rods and glue them in place using epoxy resin. 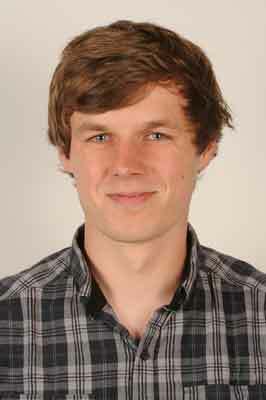 I used epoxy because it forms a bond between plastics, metals and timber without the need to penetrate into the fibres. 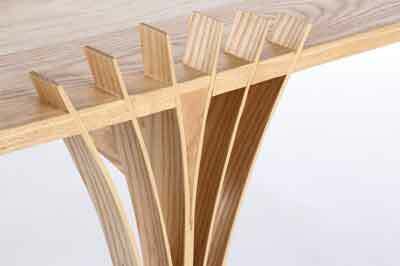 I turned the cutouts for the dowels and checked that the clip could snap around the dowel leaving a step-free edge. While the legs and back uprights were on the lathe I also turned them to length and turned a radius on the ends. Once all the machining had been done and all the wooden dowels had been sanded to 240 grit, I applied the first coat of finish. I decided to finish the wooden components before assembling the chair because it's easier to finish components when they're still individual pieces as you don't have to worry about getting finish on any other sections of the chair. It also ensured I wouldn't get any finish on the 3D-printed parts. Once the timber has been sealed it means that if there is any bleed out of epoxy resin from the joints I could wipe it off using methylated spirit. I chose to finish the sycamore using white Osmo oil because I wanted the sycamore to maintain a clean white colour and not turn a horrible yellow, which happens when using many other finishes. I masked off the joint faces and the cutout where the clips went so the glue would seep into the fibres of the timber and form a stronger bond. I didn't need to finish the seat rails as these would be covered by the seat weave. This meant I could glue up the seat frame while waiting for the first coat of oil to dry. Before gluing up the seat frame I drilled several small holes into the timber joint face to allow the epoxy resin to seep down the holes and penetrate into the fibres of the timber. One end of each rail could be glued and screwed into place, which made gluing up much easier; the other end just needed gluing. I then used one band cramp to pull the whole seat frame together while waiting for the glue to dry. Once the first coat of oil had dried I cut the dowel back to 320 grit and applied another coat of oil for a smooth finish. The next stage of construction was the under frame. This process required some thought as all the legs would need to be attached and the under frame glued together within the 30 minutes it takes for the epoxy to set. I decided it would be best to glue and screw the front legs on first before attaching the under frame and then screwing in the back legs. Once the front legs had been attached and the under frame clipped onto the front legs, I then clipped the back clips on above their location with the glue on the timber cutout and screwed the back legs in place and clipped the back clips into place. 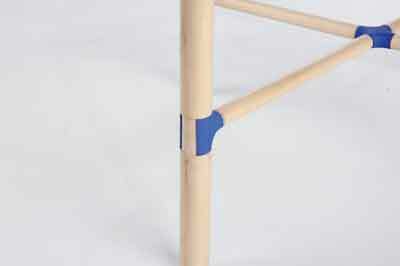 The location of the legs pushes the under frame together and closes up any gaps without the need for any clamps. 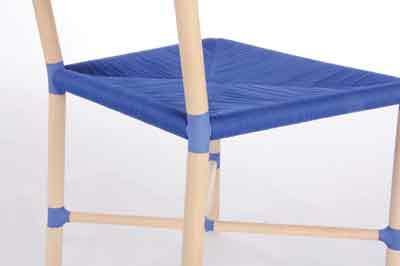 The backrests attach to the back uprights with the same design clip as with the under frame. They have a slight bend in them for added comfort. My initial idea was to steam bend them, but this process proved to be surprisingly difficult. Each piece of timber reacts differently and springs back different amounts, so it was very hard to produce three identical pieces, each with the same bend. I eventually decided that it would be easier to cut the backrests out of a solid piece of timber and to shape them round and use a template to ensure they all had the identical bend in them. Once the pieces had been trimmed to size I could start shaping the components into 19mm curved dowels. To do this I first cut the components into octagonal tubes using a 45° router cutter. This helps in reducing the amount of material I'd have to remove afterwards by hand. I could then shape the octagonal pieces into round components. I used round and flat-bottomed spokeshaves and 80 grit abrasive paper to help remove any of the high spots left around the dowel. After shaping the backrests, I had to put a slight round shoulder on each end so that they matched the rest of the components. I put a new bed on the router table and used a bearing cutter with only a very small amount of the blade extruding, holding the dowels upright I then very carefully twisted them until the shoulder went all around. The final stage of the frame assembly was attaching the backrests to the clips, the clips to the back uprights and the back uprights to the frame. To do this I again only needed to use one band cramp to pull the components together and remove any slight gaps. 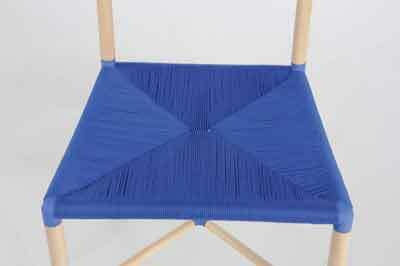 The seat was woven using blue polyester cord to match the nylon joints. After several failed attempts I eventually developed the knowledge and skills required for seat weaving and understood the importance of following a strict plan otherwise the weave wouldn't meet correctly in the middle. I chose to do a weave that had the finished appearance of lines coming in from each corner and meeting in the middle. I chose this design as my chair frame isn't square and using this method you could fill in the corners before moving onto the rest of the seat. I think the finished weave looks good and is very firm with minimal sagging even when you're sat on it. 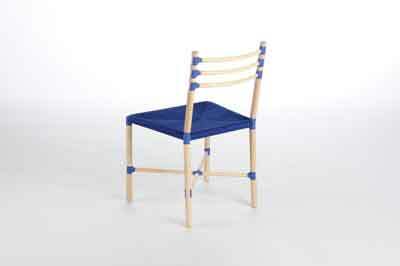 I also feel the thin weave adds to the final appearance of the chair as it maintains its sleek, elegant design. I'm very pleased with the final appearance of the chair, particularly with the colour combination and how well all the aspects of the design have worked. I feel that I have proved that the potential of 3D-printing for furniture making truly does exist and I'm very interested in the future of the industry and what I can do to inspire a new generation of creative thinkers who will hopefully continue to push the boundaries of what is possible. 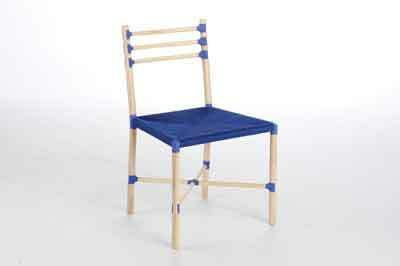 You can view an interactive PDF of the chair design on my website.